Thanks to everyone who has responded to the Knit Local idea. 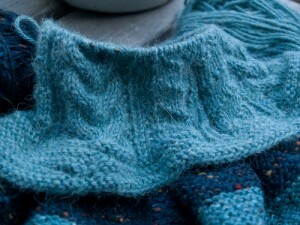 We’ve got a new group flourishing on Ravelry – invite yourself in if you’re interested! I envision it as a resource for crafters trying to find local producers, research the origins of various yarns, discuss local yarn substitutions for popular patterns, and spread the word about small companies they love, as well as a showcase of beautiful knits made from local materials. Perhaps it will spawn swaps as fiber enthusiasts from different regions exchange hard-to-find local gems. While I’m dreaming about the directions Knit Local could take, I’ve also been knitting. 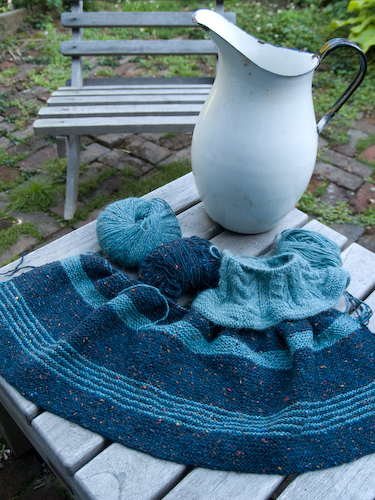 I’m thisclose to finishing my Indigo Ripples skirt: only another ten inches of the (seemingly interminable) bind-off row remain, and the quest for a suitable drawstring, should I opt out of the five feet of i-cord. I’ve got a cabled hat going for my brother’s belated birthday present, in a lovely alpaca grown in our hometown by a farmers’ collective called Honey Lane Farms. This stuff comes in 52 colors, and it’s soft as a baby’s bottom. Speaking of babies, I’m bog-bog-bogging along on a Baby Bog Jacket for the little man across the street, whose first birthday is next week. I’ve passed the “thumb trick” arm divide and I’m getting ready to toss in a handful of shortrows and a measure of shoulder shaping. All that garter stitch makes good carpool knitting, now that school is back in session. Oh, school. The year promises a steady rolling boil in all the pots on the stove, requiring precise timing and keen attention, but will be fulfilling if I can keep a cool head while coaxing all the projects to fruition. I haven’t even counted the minutiae I’m responsible for this year on top of the major publishing efforts; I’m just taking it as earning my stripes in this place where everyone gives all they’ve got for the kids and one another and the broader community. I’m not going to blog it just yet because it’s a secret something for a special someone with an approaching birthday who sometimes reads here. But tune in on Ravelry to glimpse the pretty in the next couple of weeks. Finally, thanks to everyone who’s written with kudos and excitement about my Footlights Cardigan. I’m loving the absinthe-green version just as much as the yellow one. Yesterday’s news (to me) that Butternut Woolens had closed hung heavy in my heart. Shelly’s wrenching post about giving up her farm, her dream, her family’s lifestyle, her sons’ chance to grow up on the land as she did, touched something deep. I’m a rural girl — not a farm girl, but a woods girl, an island girl — who moved to the city, but all along I’ve trusted that the doors are open to go back to that life of forests and fields, seashore and small town, flora and fauna and clean air and quiet. But it’s hard to make a living close to the land nowadays. My sister-in-law and her husband breathe the struggle every day as they fight for their dream of living off the land in Texas, or Oklahoma, or wherever they can manage to lease enough acreage and scrape by to get their lambs to market. The scope of their vision, their sheer cussed determination to make a go of it in a profession conventional wisdom says is doomed, has always astonished me. But dreams like Shelly’s — a five-acre plot, a modest menagerie of sheep and rabbits, a little business dyeing, spinning, and selling wool — it saddens me deeply to see those die. It wasn’t so long ago that many, many Americans lived this way. I’m not saying I think life was easy for them, or financially stable. I just want to believe that it’s still possible to farm on a small scale, as a vital part of a local economy. I want to live in a world where you can get eggs and milk and produce and wool from your neighbors, because I think it’s a sustainable way to exist, and because I value the bonds that are formed when your children can see where their food comes from and when neighbors know they can rely on each other for help, solace, and celebration. These relationships exist in the urban world, too, of course. I’ve never had as close-knit a group of neighbors as I do in Portland. I love that we’re part of a CSA (Community-Supported Agriculture) that lets us help with the farm work now and then. It’s important to me that we can get good food that hasn’t had to travel around the globe to reach our table. But yesterday I started to think: if Local is valuable to me in my food, and in the clothes and goods I buy, why haven’t I carried that sentiment over into my knitting? Why haven’t I committed to supporting small farmers like Shelly whenever I can? Download it to your computer and put it on your blog if you think you’d like to support more farmers and artisans in your own community. (Or use your own superior skills to make a better button, and then come back here and tell me about it!) I might even start a Ravelry group where folks can share their local-origin knits. 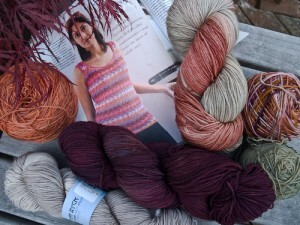 The background photo in the button is another skein of sock yarn from Butternut Woolens. I happened to be loitering in Abundant Yarn (a great resource for local stuff – they do a lot of their own dyeing with natural dyestuffs, and they also carry Imperial Stock Ranch and a number of other Oregon products) yesterday afternoon, and I spied this tempting skein of shifting rusty reds in a display basket. I picked it up, and lo, it was from Butternut Woolens. It was one of only a few remaining skeins, and it felt like a sign after I’d been mulling over Shelly’s quandary all day, so home it came with me. The gesture was small, too little too late, but it felt like a tiny step in a worthy direction. Butternut Woolens may be gone, but a beautiful pair of red socks in my drawer will remind me that it existed and meant the world to one woman in Gaston, Oregon. Thank you, Shelly, for the lovingly crafted yarn, and for opening my eyes a little wider. While Mr. G was in Toronto, I had to point out to him that he was in Yarn Harlot country, and that while she herself was a stone’s throw from my own home town at the time, he should really be storing up impressions of the lay of the storied land to relate to his wife. He should especially keep an eye out lest he should happen to stroll by Her LYS. I may have suffered the most fleeting of disappointments that this is a Budweiser cap and not Molson or some other brand that’s, well, Canadian. But it’s still an awesome idea, and it’s also a magnet — a pleasingly powerful one at that. But let’s pull back for a better look at the yarn, no? Just imagine how improved the world of knit blogging will be if they ever invent Pat the Bunny technology for computer screens. You know, so you can feel the yarn in the picture. 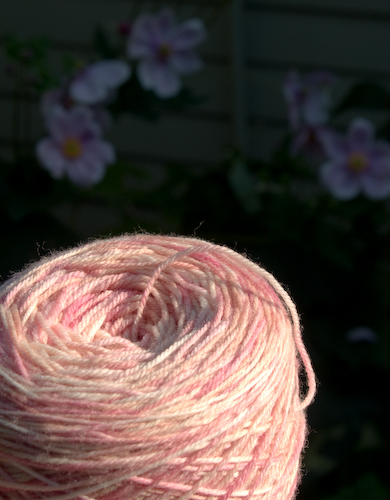 Because this is HandMaiden Casbah: a collective 975m of 80% merino, 10% cashmere, 10% nylon. Ain’t it glorious? Poor Mr. G was a little crestfallen that he hadn’t brought me something I’d never seen in the U.S., but I assured him that he’d managed to peg one of my very favorite yarn companies, and it’s a colorway I’ve never seen. 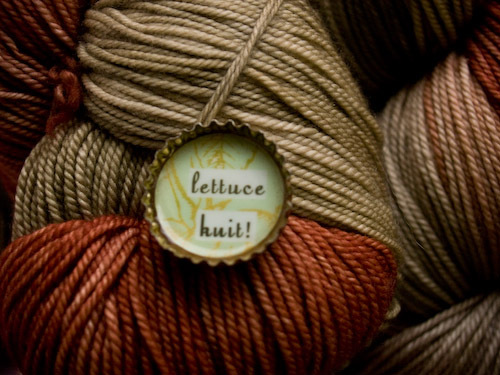 It isn’t on the HandMaiden colour card – perhaps it’s exclusive to Lettuce Knit? According to the company’s information, this is designed to be a sock yarn. I’m here to tell you it doesn’t feel like one. And I have such a wealth of it! I do believe it needs to be a sweater of some kind. I think I’ve written before that I have opinions about the use of variegated yarns in large garments. Socks can be as rangi changi* as you like. Babies can get away with anything. But it’s tough to sell me on strong random color changes in large swathes. I need regular striping or something to subdue the chaos. I’m half considering designing a sweater made out of narrow strips of garter stitch so I can figure out the color repetitions and make them stripe. That instinct, I realize, borders on the psychotic. Think of the seaming! There must be an easier way. Miters might do it, for instance. 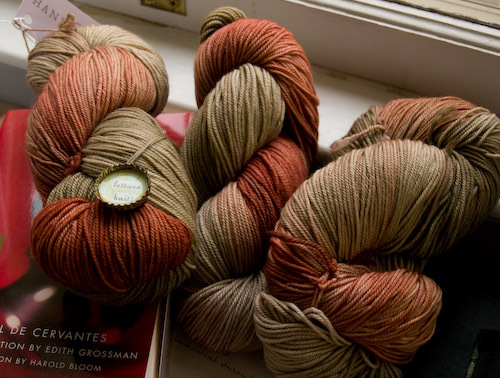 So leave me your suggestions – what patterns do you know that might make the best use of these soft desert colors? Of course, I can always settle for a lovely lap blanket. The yarn is machine washable, after all. And no matter what it becomes, my husband is a sweetheart. *This is a useful Nepali word with the felicitous dual meaning of “riotously colorful” and “drunk.” Honestly, is there a better descriptor for some of the sock yarn out there? Why don’t we have an equivalent word in English? Nepali fills many holes in my English lexicon. Another is kaancho, which describes the mouth feel of under-ripe bananas.